I've been getting a lot people on the Help threads that need a little assistance with installing plugins. Many members of PSP-Hacks use plug-ins and add-ons to either enhance game play, with plug-ins such as CWCheat and TempAR. Other members use plug-ins to unlock the potential of the PSP, such as the VSH Menu add-on and BrightPad. Many of late have now been able to use the PSN and PSStore with PSNLover and PSNabler. As they are enabled, they help customize the functionality of homebrew. The architecture of a plug-in also can extend the capabilities of official software. 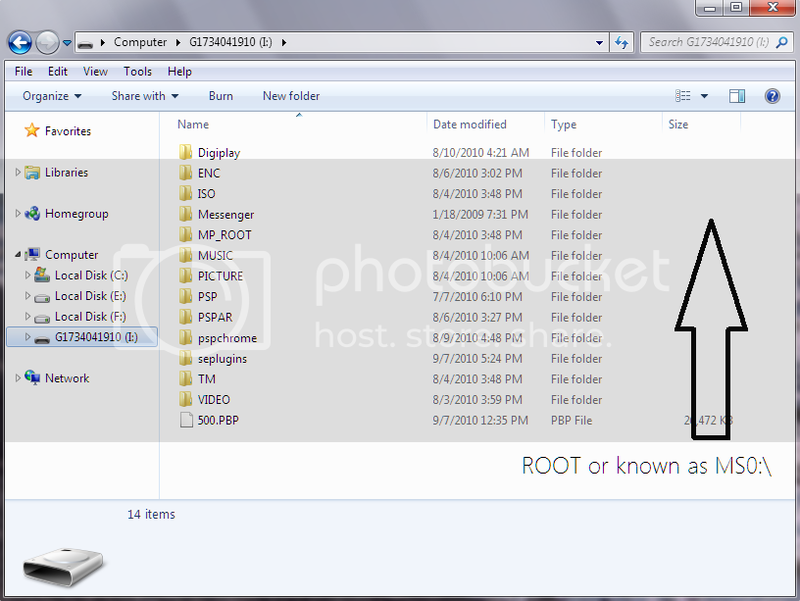 HERE is a link for the plugins that PSP-Hacks has compiled. First off, whenever you download a plugin, it will be archived via zip, rar or 7z. 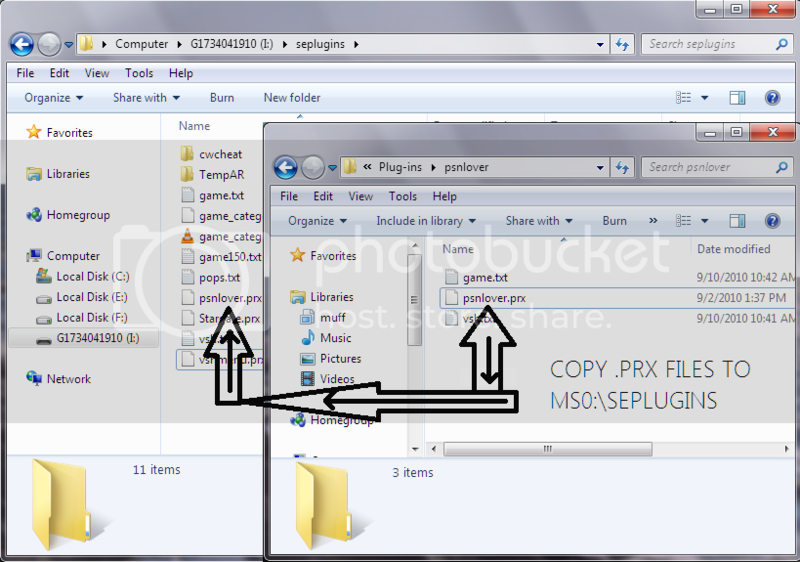 You'll extract all the files/folders to somewhere you can easily access them. 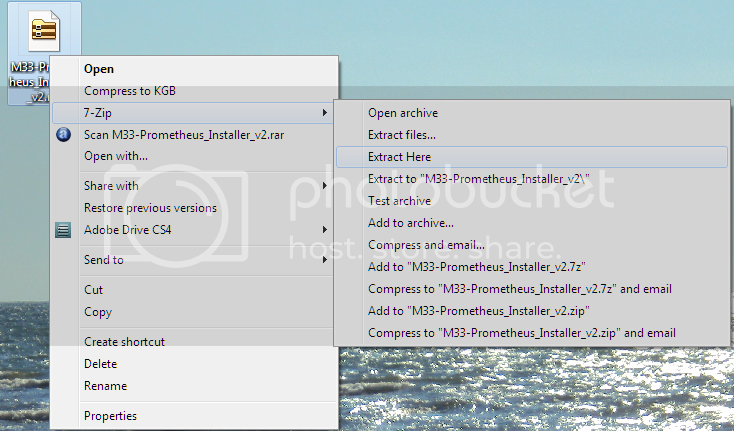 Next, you'll find a folder on the root of your Memory Stick Pro Duo called seplugins. From here on out we'll use the term ms0:\ for "root." 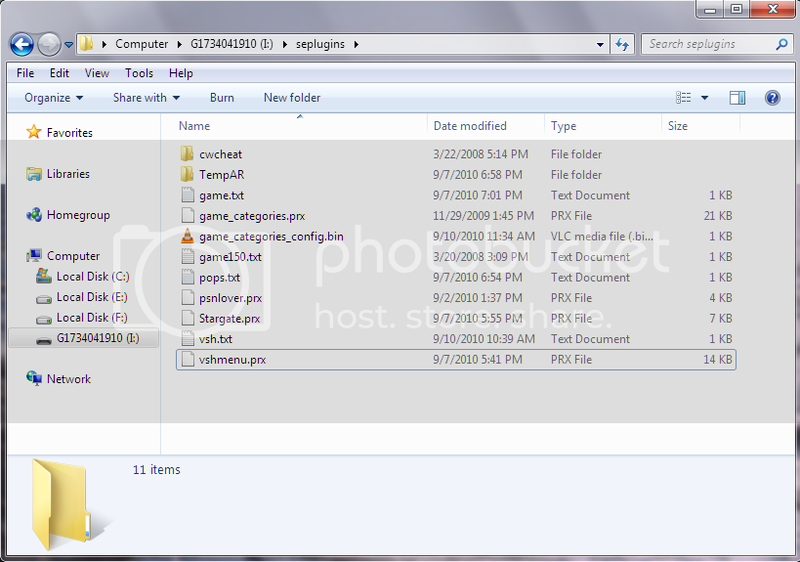 If you have never installed a plugin just place the files, that are in the archive, right into the seplugins folder. But if it's not the first time installing a plugin you'll want to make sure to see if there are files called game.txt, vsh.txt and pops.txt. If your plugin archive contains any of these files you must open the those documents and add the command lines manually. 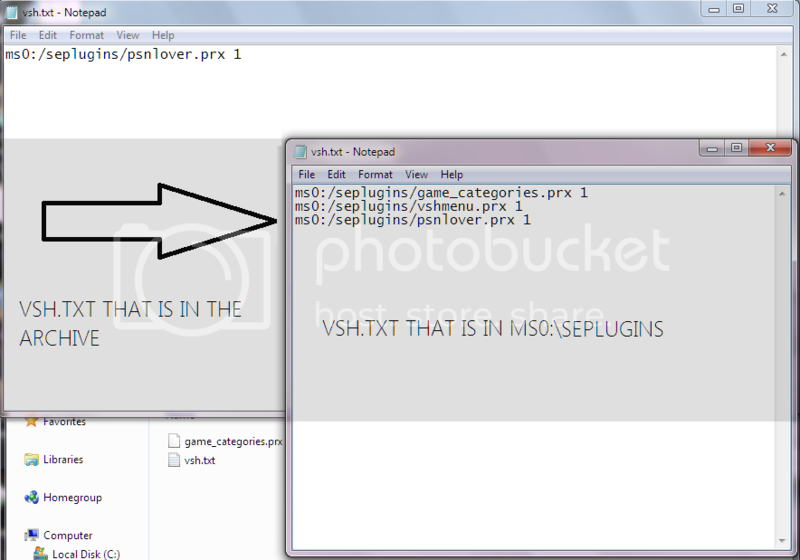 For an example I am going to install the 'PSNLover' plugin. to the game.txt file and vsh.txt file manually. NOTE 2: The '1's next to the command lines represent the plugin being enabled. NOTE 3: Make sure that if you use an auto installer that the game.txt, vsh.txt and pops.txt are WRITTEN TO and not WRITTEN OVER; installers have the possibility to overwrite files, and one of those files may be those of the seplugins folder. Here you'll, close and save the text documents and then you'll need to place the .prx files directly into the ms0:\seplugins directory. Next you'll simply restart and your plugin is enabled. You can either go back to the ms0:\seplugins directory and open up the vsh.txt, game.txt and pops.txt file and look for the '1' next to the plugin command line and put a '0' where the '1' is. You can go to the Recovery Menu; when you're restarting the device, you hold the R-trigger ontop the device. This will bring up the Recovery Menu. In here you can enable disable the plugins you installed. Awesome!I hope this gets sticky! Also may i recommend that you use spoiler tags for the pictures? Last edited by Kerrigan666; 09-23-2010 at 06:34 PM. Thanks for your support Dimos, I really do appreciate it. Yeah. I guess I should..
EDIT: Hows that look, Dimos? Last edited by TribFather; 09-23-2010 at 06:52 PM. we could use one of these tutorials. Thank you guys. I really think it will come in handy as well. Last edited by Organized_Chaos; 09-23-2010 at 08:01 PM. Thank you very much for letting it stay. Last edited by Organized_Chaos; 09-23-2010 at 08:24 PM. I don't think I can spice mine up anymore..